"Looks pretty normal to me . . . "
Travis Mayweather had no reason to suspect that he was not in the year 2154 . . . but in fact, the year was (approximately) 1944. 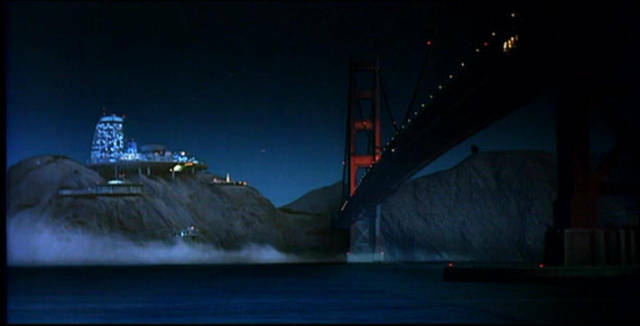 Even given that the shuttle's angle of descent precluded a view of the Golden Gate and surrounding areas, the fact that the city itself some 210 years later didn't appear at all different to him came as a surprise to some viewers. To be sure, a similar comment was made in Star Trek IV regarding a nighttime view of 1986 San Francisco, but there's a wide gulf between "pretty normal" and "really doesn't look all that different", especially when in the latter case the Enterprise crew knew they'd travelled back some 300 years. Hence the origins of this section, as I started looking about for views of the city. The satellite images below give an overview of the city. On the left is an overhead view, the upward direction being north. You can see the long horizontal green strip of Golden Gate Park, with the Twin Peaks area visible as a round spot just beneath. On the right is another satellite image, showing a view from the southwest. 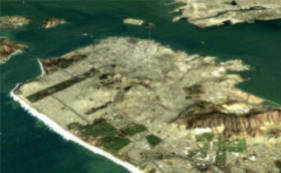 Yerba Buena is top-center (with Treasure Island the white extension to the left), with the brown San Bruno Mountain to the lower right. As you can see, Mayweather's shuttle was headed east, approaching from the Pacific. Incidentally, you might've noticed the sun, high and to the left, reflecting off the water in the approach scene. That is a blooper or 'optical illusion' of some sort . . . the apparent angle of the sun from that reflection is simply not possible. It would require that the sun would be overhead at a point well to the north of the Tropic of Cancer, which is the highest northward point at which it can be overhead. In other words, the Earth's rotation would've been smoking crack in 1944. 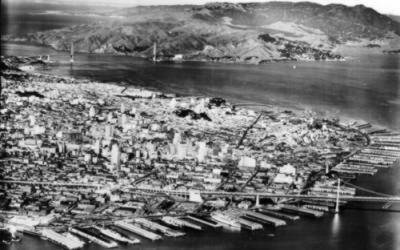 Below is an aerial view from the 1940's, taken from southeast of San Francisco and looking toward the northwest (or, in other words, a view pretty much perpendicular to the center image above). The Golden Gate Bridge is visible in the distance, with the Bay Bridge cutting across the bottom of the image. Note how the Golden Gate's north tower is on the shore of the Marin side, whereas the south tower is placed well into the waters of the bay. This makes for an easy way to determine direction in views of the bridge. And, here is a view of the city downtown as taken from the north (toward Alcatraz) on a morning in the early 1990's. 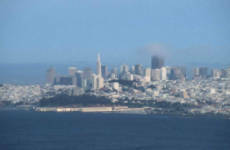 You can see the easily-recognizable pyramid of the TransAmerica Building, as well as the similarly-skyscraping Bank of America building, the large black slab to the south and west. The TransAmerica Building is some 48 stories tall, rising 260 meters from street-level. Along with those tall buildings are a substantial number of 20-30 story structures, most dense along the left of the image (toward the east). Somewhat entertainingly, despite the fact that the original idea for this page was based on demonstrating the idea that 2150's San Francisco wouldn't look anything like San Franciso of the 1940's, there aren't many complete views of the skyline in the 2150's for me to use in comparison. (Update: This has changed somewhat with the episode "Home"[ENT4], and at some point I'll update the page accordingly.) Though the round porthole windows of Admiral Forrest's office appear to look toward the city, I have yet to find a decent view out of those windows that provides any detail. We also get a decent view of the building from another angle at night, though again this is of little help in regards to the city itself, which would appear over to the right of the image. The dark-walled building with yellowish windows (visible in the lower center of the first image) has no fewer than 18 visible window-rows, and there still appears to be no street-level visible even further toward the left. As a result, the building must be around 25 stories in height at a minimum, with Archer's apartment therefore being around 30 stories above the surface. (To the left of the yellow-window building, then, must be a building over 30 stories tall.) Given the height of Archer's window, the view through the sheer curtains showing even taller buildings to the right must therefore be showing buildings no less than 40-50 stories in height, depending on their distance . 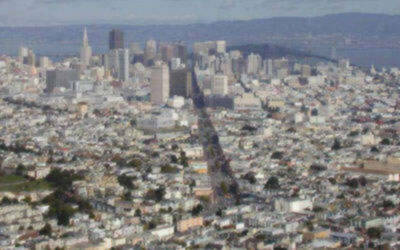 . . and perhaps depending on whether they were built on some of San Francisco's famous hills or not. The images would seem to be roughly consistent with modern San Francisco in the most limited interpretations, though perhaps with a greater density of ~30 story buildings being indicated. Of course, the flying cars visible in the image would certainly keep a modern San Franciscan quite confused about his whenabouts. Even without much direct evidence of the full 2151 cityscape, though, the images from the 2150's and the modern era clearly indicate a substantial difference between those times and the 1940's. Further, we have plenty of missing landmarks from today's San Francisco compared to the 1940's version to make Mayweather's comment odd . . . and as we'll soon see, most of these persist into the Star Trek era. The TransAmerica Building, the Bank of America, and the new east span of the Bay Bridge come immediately to mind. Even though Travis was a space-boomer who'd lived on a cargo ship for most of his life, the fact that he went through the Academy means that he ought to have seen plenty of San Francisco . . . or, to put it another way, there's really no excuse for his comment. In 2272, the V'Ger entity threatened Earth. 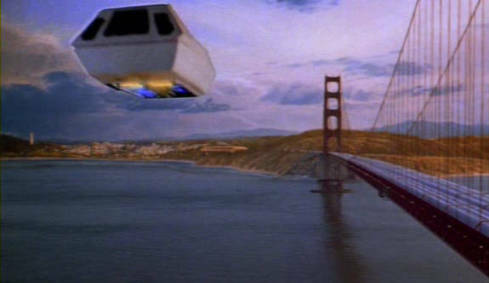 Captain Kirk's journey to stop the device begain in San Francisco, as seen below. The city visible in the distance is much different than the San Francisco of today. Below, you can see a side-by-side view. 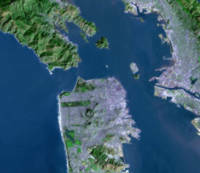 Note that the image of modern San Francisco, showing the entirety of the city's tallest buildings, shows only the same area as the left side of the 2272 image. Thus, we can see that the areas south of downtown have built up tremendously. Whether this buildup follows Market Street or is along the shores of the bay is, unfortunately, impossible to tell in the image. There also appears to be more build-out into the water on the bottom of the image. Unfortunately, it's not possible to tell in the images if the new section of the Bay Bridge survived into the 2270's, though the TransAmerica Building and the Bank of America appear to be visible along with several additional ~30 story structures. Also of interest are the twin towers rising to the sky toward the south of the modern downtown, along with several other 50+ story buildings between the two areas. The twin towers ought to be somewhere in the size range of the Petronas Towers of Kuala Lumpur, Malaysia (widely, if erroneously, considered the tallest buildings in the world), and their tapering tops appear quite similar. The image below is meant to show the Marin (north) side of the bridge, but it includes an unfortunate flub. Note the bottom of the tower resting in the water . . . this only occurs on the south side, but we're supposed to be looking north. Further, the structure visible beyond the tower in the water is the buildup over an old fort, again a structure on the south side. We could presume that there had been some sort of geologic event that eroded the Marin side so that both were free-standing in the water . . . however, the 2272 shot above with the air tram flying toward the city appears to show the north tower just as it is today, as does the scene within the air tram's landing area. In any case, if we ignore the tower issue, then we can look at the image and see that besides some unspecified buildings (seen above as intriguing round structures), the Marin side looks little different than it does today. The Starfleet facilities of 2151 would be offscreen to the right. Note well that the bridge deck, presently a roadway, has been covered over by two flat-topped tube structures. Below, we see the air tram's destination on the south (San Francisco) side, with the Presidio area beyond. The structure over the old fort is clearly visible. The city is mostly obscured by a wall and the bridge itself, but we can determine a few things. For starters, this image appears to show more buildup to the right of the closest bridge tower, which ought to place the apparent structures either to the south or west of the modern downtown buildup. Why? Thus, the angle of view would seem to require that the new buildup be in the specified locations. That new buildup is consistent with the 2272 overview of the city, and may imply additional construction beyond what was seen then. We may get a very good view of the area of the intriguing round buildings to the northwest of the bridge. 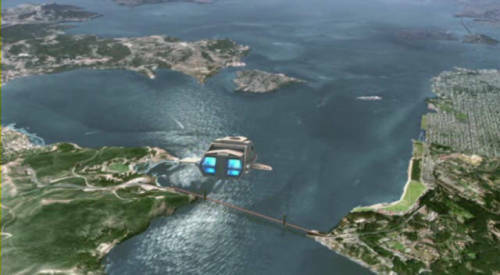 In the image below, note the angle of view of the bridge, and the fact that the city is visible beyond. This would seem to put the location as being on the north side of the bridge, and well toward the Pacific (west) side. You can also see some undeveloped hilly land just above the shuttle cockpit. While the precise layout of structures is not visible in the 2272 shot, it stands to reason that there could've been new additions at or near that location. Some of the 23rd Century shots as seen several images above are visible as representations of 24th Century San Francisco in other episodes. This is true in "Conspiracy"[TNG1] from 2364, which features the daylight platform shot three images above. Beyond that, we just don't see San Francisco (or Earth altogether) too often. We do get the occasional glimpse, however. In 2368, the Enterprise returns to Earth for Starfleet Academy graduation ceremonies in which Picard is to participate. While there, we see the grounds of the Academy. While clearly near the Golden Gate Bridge, it's difficult to determine which side. There may be a smudge indicative of the old fort in the distance which would imply that we're on the Marin side, but unfortunately it simply isn't clear. 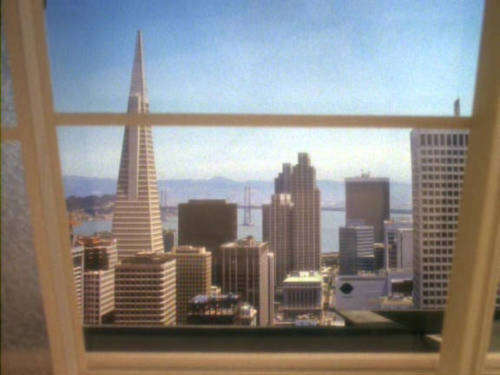 In 2372, we get to see some glimpses of San Francisco during "Homefront" and "Paradise Lost"[DS9-4]. Our views of the city are unfortunately quite limited. 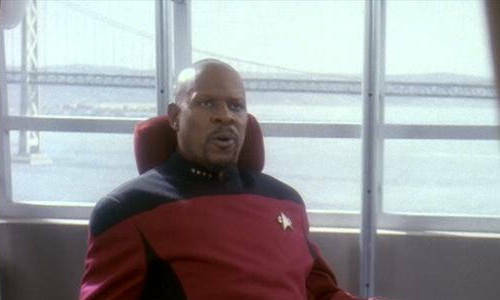 Below, we see Sisko's office during his temporary posting as Chief of Starfleet Security on Earth. The view outside is of the western span of the Bay Bridge. The tower on the left has a compatriot over on the right, not visible in the image above. By the angles and lack of great distance, this requires that Sisko's office be somewhere on the northeast corner of San Francisco, near downtown. Were the bridge further away, we could conclude that Sisko's office was on Alcatraz . . . which would be quite entertaining. But, alas, it seems not to be the case. The way it is played in the two episodes, the building above is apparently supposed to be the same as the building below. 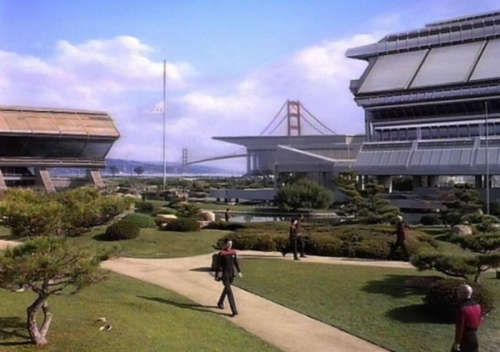 However, the angle of the Golden Gate towers is incompatible with this idea, as is the height differential of the short building below versus the tall structure Sisko must be inhabiting. The scene below appears to take place a bit to the east of the Presidio, and possibly some distance south. We do get some additional Earth shots in "Non Sequitur"[VOY2], wherein we see Earth and San Francisco of 2372 thanks to a temporal anomaly involving what's supposed to be a slightly-parallel universe. As with "Conspiracy", though, extensive re-use of footage is the key to this episode. 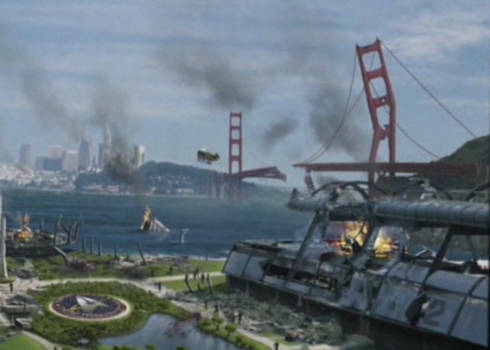 Below, we get an establishing shot of Kim returning to San Francisco. (In reality, this is a re-used shot from the original version of TMP.) The same pattern of bridge covering exists, and the air tram, apparently headed toward the San Francisco side of the bridge from the north, is quite similar to its counterpart from 100 years prior. Its heading is unclear . 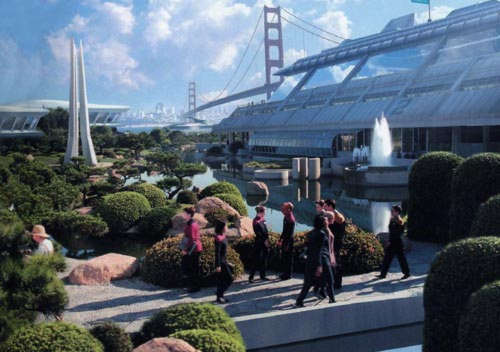 . . the 2272 Starfleet facility has been removed from the edge of the bridge, though it appears that in the center of the frame there may be a replacement structure further along the shore. The Presidio itself appears largely devoid of trees. The city itself is not visible in the shot, though we do see a small tower to the left and various small structures. 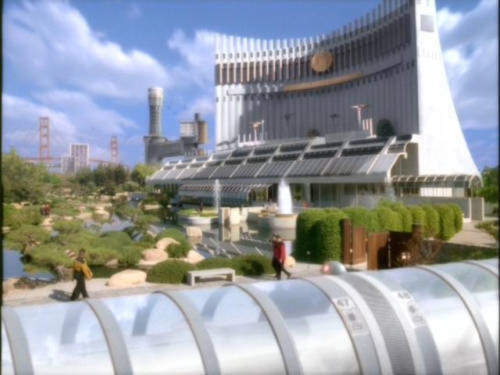 The above scene of Starfleet Headquarters is the result of a small but meaningful Breen attack on Earth during the latter days of the Dominion War. 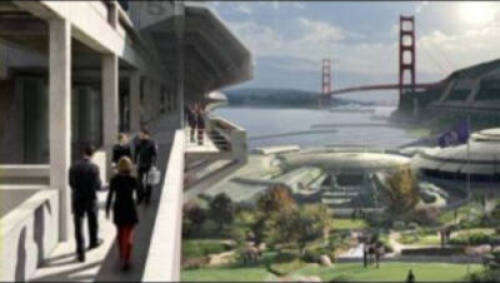 On the lower right, you can see a building which appears to be the same as the 2150's Starfleet HQ at Fort Baker. The really interesting part of the image, though, is to the left of the battered Golden Gate Bridge. A cityscape is visible in the distance, apparently beyond the Presidio. The angle of view precludes that from being the downtown San Francisco of today, or even the built-up area to the south as seen in 2272. 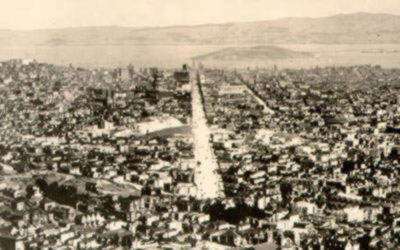 Instead, this cityscape is directly south of the Presidio, and appears to be some distance beyond. It is probably located in-between the Twin Peaks area and San Bruno Mountain (either in what is now called Stonestown or Daly City), and the buildings would be just huge. There's also an aerial view of the grounds of their simulation facility. Unfortunately, the version I have available is of low quality, so further analysis will have to await the release of the season on DVD. Skipping back to the alternate-2372 for a moment, "Non Sequitur" includes another non sequitur insofar as the view out of Harry and Libby's apartment. The shots above indicate that the apartment is about 30 stories up, and it would seem to be a new building to the west and a bit south of the TransAmerica Building, readily visible in the shot. However, the apartment is explicitly stated as being on the fourth floor (also being named as Apt. 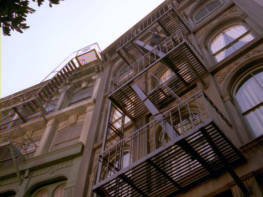 4-G), and as Harry departs the apartment via fire escape later in the episode, we see that he must be on the top story of a four story structure (note the tree, or the fact that the street is not too far down when viewed from the fire escape, as seen in other shots from the episode). Though San Francisco is famous for its hills, this is quite ridiculous. At present, there is no hill of sufficient size and at sufficient range to account for the discrepancy. Further, the building visible behind Libby toward the west, though closer than the TransAmerica Building to the apartment, would still be of more than sufficient height to dwarf the TAB. Why would that be odd? Because the view out of the window toward the east seems to suggest a downtown San Francisco no different than that of modern San Francisco. Perhaps the "Old City Festival" sign on the streets had more meaning than might otherwise have been apparent. In short, "Non Sequitur" really monkeys up the issues. 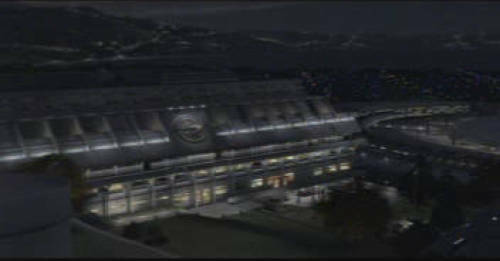 The new buildings visible in 2272's downtown would've had to have been destroyed, with the old downtown restored to a circa-2000 "Old City" state. And yet, at the same time, old-looking buildings with old-style fire-escapes would've had to have been placed atop a brand new hill rising some 150 meters into the sky, with extremely tall buildings just beyond. And, of course, there would be the issue of the "New San Francisco" south of the (reforested) Presidio, which means that Earth basically would've had to have constructed an entire city, quite large by modern standards, in about three years. Is such a concept possible? In a word, yes. A number of modern cities with an eye toward history have sought to engage in restoration of various structures or areas to their appearance in older times, especially in regards to downtown areas that the 20th Century's affair with the automobile have rendered almost obsolete in some cases. It's not a leap to conclude that in the future, a city might reshape its entire skyline out of the same spirit. And, with sufficient resources at their disposal, they could virtually move the city a few miles, building replacement buildings anew. However, it seems wiser at this juncture to evade such a conclusion. It's not too great a leap to conclude that the representation of old downtown . . . at once both improbable due to the issues already noted and impossible due to the never-changing sun angle . . . could be a 'huge canvas covering an entire wall', but done in 'delicate realistic detail', with lighting designed to make it look realistic as the transition from day to night and back again occurred. San Francisco is seen to survive the San Andreas fault, the Eugenics Wars, WW3, and so on. It does so quite well, thriving into the 24th Century and lasting for hundreds of years as an ever-growing city of major importance for Earth and other planets. The entire peninsula becomes a large built-up area by the latter 24th Century . . . though one can still imagine Mayweather flying in to 2375 San Francisco and saying it looked pretty normal to him. Hopefully the fourth season of Enterprise will open with Trip smacking him upside the head. Special thanks to the San Francisco Public Library, the San Francisco Virtual Museum, World from the Web, and SFquakes.org.